Here we go! The time has finally come for us to start our Afghan!! If you missed the materials list you can find that post in the Crochet-A-Long tab at the top of the page. Each week I will post a Free Pattern section on Saturday morning… All CAL weekly Free Pattern sections will be posted in the Crochet-A-Long tab throught the entire CAL. Once complete it will be posted as a pattern in whole and available in the Pattern Tab. You can follow along here each week, And you can also join me on Ravelry with my Crochet-A-Long Group, on Facebook each Friday evening for our “Show and Tell” and on our Pinterest Board designated just for this CAL… If you want to post your progress pictures on Pinterest you need to shoot me an email to [email protected] so I can add you to the group! 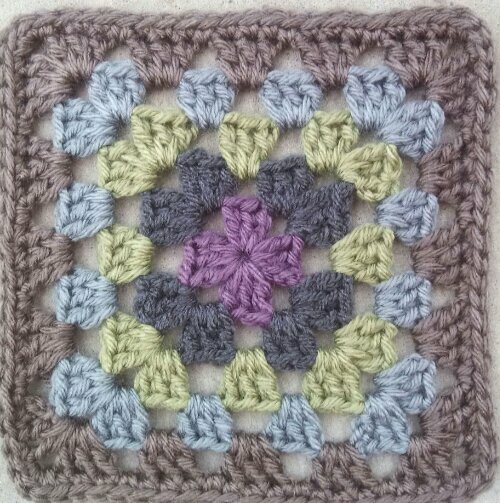 This CAL will start with 8 basic Granny Squares, Each Granny Square should be approximately 6″-7″ across… Gauge is not important so if you want to make a smaller or larger blanket you can adjust this by your hook size…The dominate or neutral color will be worked for the LAST ROW of each square. You can use it more than once in your square if you desire. 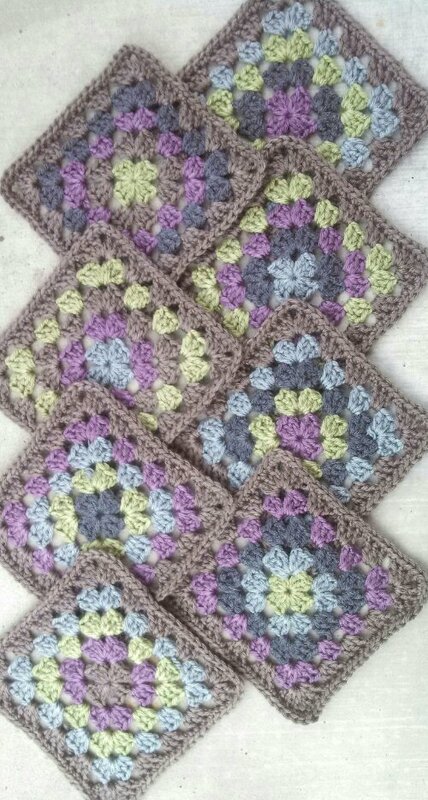 These will be the only time we use Granny Squares in this pattern… We will be joining them together in a specific manner next week… This afghan will be worked in the round. These are my 8 Granny Squares… I am loving my colors!! I work over my ends as I go. This saves time weaving the ends in. I also prefer the Magic Circle to start my project, Click Here for a video tutorial. If you prefer to use the basic method of Ch 5, join into a ring that will work just fine! You can use as many colors as you like, or make this a solid color afghan. Row 1: Ch 3 (Counts as Dc now and throughout), 2 Dc in center of ring, Ch 2, *3 Dc in ring, Ch 2*, Repeat * * 2 more times, Join with Sl St to top of Ch 3. Pull center tight = 4-Dc 3 clusters and 4- Ch 2 spaces. Fasten off. Row 2: Join next color to any Ch 2 space using a Sl St. Ch 3, 2 Dc in same as joining. Ch 2, 3 Dc in same space, *Ch 1, 3 Dc in next Ch 2 space, Ch 2, 3 Dc in same space*, Repeat * * 2 more times. Ch 1 Join to top of Ch 3 with Sl St. Finish off. = 8 – Dc 3 clusters, 4 – Ch 2 Spaces and 4 – Ch 1 Spaces. Row 3: Join next color to any Ch 2 space using a Sl St. Ch 3, 2 Dc in same as joining. Ch 2, 3 Dc in same space, *Ch 1, 3 Dc in next Ch 1 Sp, Ch 1, 3 Dc in next Ch 2 Sp, Ch 2, 3 Dc in same Ch 2 Sp*, Repeat * * 2 more times. Ch 1, 3 Dc in last Ch 1 space, Ch 1, Join to top of Ch 3 with Sl St. Finish off. = 12 – Dc 3 Clusters, 4 – Ch 2 Spaces, 8 – Ch 1 Spaces. Row 4: Join next color to any Ch 2 space using a Sl St. Ch 3, 2 Dc in same as joining. Ch 2, 3 Dc in same space, *Ch 1, 3 Dc in next Ch 1 Sp, Ch 1, 3 Dc in next Ch 1 Sp, Ch 1, 3 Dc in next Ch 2 Sp, Ch 2, 3 Dc in same Ch 2 Sp*, Repeat * * 2 more times. Ch 1, 3 Dc in next Ch 1 space, Ch 1, 3 Dc in last Chain 1 space, Ch 1. Join to top of Ch 3 with Sl St. Finish off. = 16 – Dc 3 Clusters, 4 – Ch 2 Spaces, 12 – Ch 1 Spaces. Row 5: Join next color (Your dominant or neutral color) to any Ch 2 space using a Sl St. Ch 3, 2 Dc in same as joining. Ch 2, 3 Dc in same space, *Ch 1, 3 Dc in next Ch 1 Sp, Ch 1, 3 Dc in next Ch 1 Sp, Ch 1, 3 Dc in next Ch 1 Sp, Ch 1, 3 Dc in next Ch 2 Sp, Ch 2, 3 Dc in same Ch 2 Sp*, Repeat * * 2 more times. Ch 1, 3 Dc in next Ch 1 space, Ch 1, 3 Dc in next Ch 1 space, Ch 1, 3 Dc in last Ch 1 Sp, Ch 1. Join to top of Ch 3 with Sl St. Finish off. = 20 – Dc 3 Clusters, 4 – Ch 2 Spaces, 16 – Ch 1 Spaces. Weave in any loose ends with a yarn needle. All Done… Congratulations on finishing week 1!! I prefer to block these Granny Squares with a steam method. Lay each Granny Square flat on ironing board. Gently steam each square, being very careful not to press down on the yarn… You will only hover over the square. Gently manipulate each square into shape before it cools. Leave on ironing board until completely cool. If you prefer to block your squares by pinning them to a foam board and letting them sit that is also a great way to obtain a great shape! Have a great week!!! Don’t forget to show up Friday evening on Facebook and share your progress. Check the Pinterest Board also… and for more discussion and fun… Hop over to Ravelry! Just a few more days to go and our hooks will all be working on a new fabulous project!!!! Next Saturday (the 18th) I will post the first segment of the pattern for our Crochet-A-Long… This is a Free Crochet Pattern to all participants and the only requirement is that you have FUN! Thanks to all of you who voted for our Viewers Choice Crochet-A-Long!!! I was excited you chose an Afghan!! I have designed it, crocheted the first section and have written it for next Saturday!!! If you haven’t done a Crochet-A-Long before… This is how it will work!…..
1.You can find the Materials List already posted in the Crochet-A-Long tab at the top of the page. As well as each weekly pattern post! 2.Each Saturday I will post the weekly segment of the pattern that you will complete by the next Friday. 3.Friday Evenings we will have Show and Tell on my Facebook Page… You can post comments and pictures on the designated Pinned Post on Facebook. 6.One last thing… We will be having a vote at the end to name this afghan!!! So stay tuned and let’s have some fun!!! Oh… And would you like a peak at Week One??? Shhhhhh…. Yes we begin with a Granny! But, that is just the beginning!! Lots of design elements and fun,,, I can’t wait for you to see how this design turns out! !